What is grace? The most basic definition is “unmerited favor.” God has been stretching my understanding of grace for the past ten years. He has been taking me deeper into the incomprehensible depths of His grace toward me. His grace not only saved me from eternal death, by forgiving me of all my sin and making me a new creature, but His grace also enables me to live the Christian life. It is this second part, grace for living, which was completely new to me. As a minister of music, I sang many songs about grace from the hymnbooks. Most of those hymns were about God’s saving grace, but they didn’t mention God’s grace for living. I was dependent on His grace for salvation, but I was depending on my self-effort to be obedient to God’s commandments for living. I didn’t realize that was a broken system, even though the outcome of my Christian walk was very broken. Over the next few years, I began to get connected with more people of like mind. They, too, understood this amazing grace and were experiencing the power of God’s grace to effect real victory in living the Christian life. As I shared what God was showing me, there were many who received this news with gladness. However, there were also those who were suspect of this “freedom” and saw it either as license or sinless perfection. Through those two distorted lenses, even I could see how “grace for living” could be rejected. I began to notice, among the “grace” crowd, this “us and them” language. There was something that bothered me deeply about this; something deep inside that said this wasn’t right. Others noticed this also and sadly abandoned the truth of God’s life-giving grace for a watered-down version of grace. It was a mix of law and grace. To them, that sounded and felt safer. Within this mixed law and grace thinking, grace becomes nothing more than an action word. “I should show them grace.” Or, “I didn’t mean to do that. Please give me some grace.” In this system, grace is a commodity to be given as you deem the other worthy. Of course, in this system, you hope others will give you this grace if you make a mistake. The greatest revelation of God’s grace for me was when I understood Grace to be a person. Jesus Christ is the personification of God’s grace. Grace is Jesus and Jesus is Grace. The Scripture says that every believer is indwelt by Christ (Rom. 8:10; Gal. 2:20; Col. 1:27). God’s grace is not based on knowledge, but on the person of Jesus Christ. Whether I understand grace or not doesn’t determine if I have grace. If I am a container of Christ’s Life, then I have Grace. So what is the advantage of “knowing” about grace? It can be compared to having a bank account with a million dollars. If you know about the account, you can intentionally spend money from the account. If you don’t know about the account, you can’t intentionally spend from it. 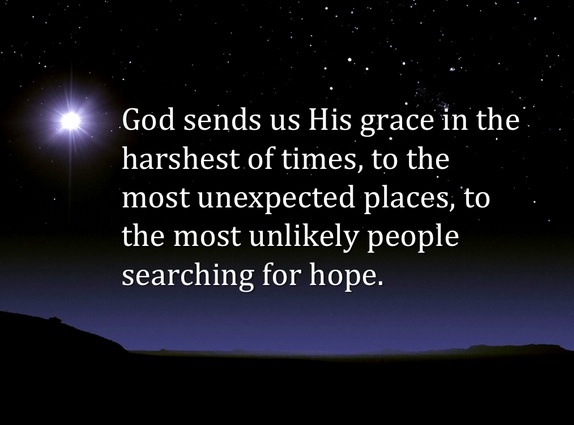 But more importantly, God wants us to know about His amazing gift of grace, a gift He has given in abundance (Rom. 5:17). What does grace or this unmerited favor look like? It looks like love, joy, peace, patience, kindness, goodness, faithfulness, gentleness, self-control, humility, and tolerance [forbearance, in KJV] (Gal. 5:22-23; Eph. 4:2). Grace looks at the heart before it looks at the behavior. Grace works from the inside-out, not the other way around. God did not change our behavior in order to draw us into a relationship with Him; He changed our nature. Now, His grace pulls that nature out of us and changes our behavior! Whether one believes this about grace or not doesn’t change the fact we have a spiritual account with unfathomable riches. We are all people of grace, because we have Grace personified living in us. Now, go out there and spend your inheritance!